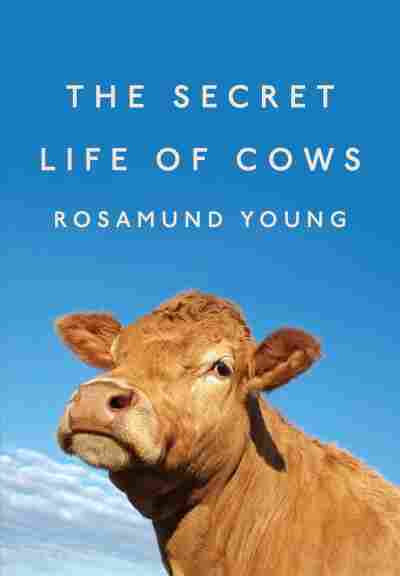 'The Secret Life of Cows' Aims To Show Animals As Thinking, Feeling Beings Farmer Rosamund Young's book will charm people who want to lap up more evidence that animals have personalities, but may not warm hearts of animal lovers who don't eat meat. A slim mahogany-colored cow, Dolly was an attentive mother to her first four offspring, all boys, at Kite's Nest farm in Worcestershire, England. Then Dolly II, a pale-colored girl, was born and became the recipient of that bovine love. In The Secret Life of Cows, published this week in the U.S. by Penguin Press, farmer Rosamund Young tells the story of what happened when Dolly II grew up and gave birth herself. Dolly II's calf was born dead and her womb was displaced in the process, requiring a vet's care at the farm. Young left Dolly II once she was resting comfortably, weak and unable to stand but appearing to be content where she lay. One hour later when Young went back to check on her, Dolly II was nowhere to be seen. "After much searching we found her three fields away," Young writes, "lying at the feet of her clever old mother being licked all over and comforted far more ably than we could ever have done." Dolly II had needed her mother and, on a large farm, she set out to find her. "We were glad to see," Young notes, "that our policy of leaving gates open to allow all the stock to choose where to roam had been vindicated." Six days later, Dolly II felt strong enough to resume life on her own and departed from her mother's side. No mother-daughter interaction of this nature could possibly take place on factory farms where thousands of densely crowded cows lack free movement — and mother-offspring ties are severed within days of a birth so that the mothers may be kept in a state of continual pregnancy and milk production. Dairy cows are "much misused animals," as Young puts it. At Kite's Nest, the philosophy is different. Calves stay with their mothers "for as long as they choose," suckling freely for nine months at least, and given leeway to decide when and where to move around the farm, as Dolly II was. The Secret Life of Cows succeeds in showing that cows are thoughtful beings with individual personalities. At times Young's approach is whimsical, perhaps overly so, as when she translates what she takes to be bovine thoughts directly into human language. The cow Black Araminta, a "magnificently capable" animal who doesn't relish human assistance unless it's absolutely needed, is voiced in this way by Young: "Thank you for all you did but from now on, help me only if I ask you to." But there's great insight, too, born of long experience: Young's parents began farming when she was 12 days old. Young notices that cows figure out what plants to eat to medicate their health troubles, and recounts the ways in which cows grieve, two points fully in line with the latest animal-cognition science. She describes how a cow wishing to be groomed by a friend will offer her head "bowed and submissive," then cautions that the head is held almost identically before a cow offers a warning before erupting into aggression. The difference, visible only to seasoned observers, is in the degree of muscle tension. Other farmed animals are described, too: a pony who by his wits manages to save an old mare wedged in a ditch; and, in one of the loveliest stories, two hens who become "devoted bodyguards" to an older companion injured in a fox attack. The pair fussed over their friend, refusing to eat until she did and offering her solace by physical touch with their beaks. This book will charm people who either didn't know — from earlier books like Amy Hatkoff's The Inner World of Farm Animals or from widely shared information by activists at rescue sanctuaries — that farmed animals think and feel, or who want to lap up more evidence that they do. It may not so readily warm the heart of animal lovers who extend their compassion for animals to the food they eat. Young notes that farmers have a "moral obligation" to treat their animals well — but at the same time she sells "retail beef," lamb, and mutton in the Kite's Nest shop. Farmers have for centuries felt affection for individual animals and then proceeded to serve those animals up for the family dinner. Yet given Young's desire to embody a different type of farmer, it would be informative to hear how she reconciles her kindness with the killing of her animals. What does she make of the argument that the term "humane slaughter" is an oxymoron because, even when it's carried out as painlessly as possible, it nevertheless deprives an animal of a life he or she wanted to live via the very intelligence and depth of feeling Young painstakingly details? She doesn't say, and that's a loss. She does remark that meat from animals reared the way she advocates "actually tastes better" and that "happy animals... provide more profit in the long run." The bovine bottom line is this: Cows would no-doubt use their reasoning and decision-making powers, so enticingly outlined by Young, to choose in a fast heartbeat to leave a factory farm and dwell instead at Kite's Nest farm.